JIS is a cartoonist from Mexico--one of the greatest cartoon surrealists ever. Here's his current profile picture on Facebook. 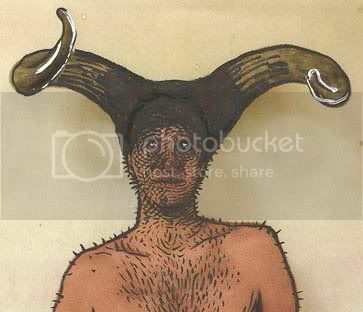 JIS as a horned god... perhaps as Pan himself? Happy birthday JIS. Master Boyd: happy morning today my friend; I'm very busy receiving hugs, and facebook is making it a festival, wow! We have lots of stuff to discuss and chat, Robert; please keep and touch. Thanks for everything, man!